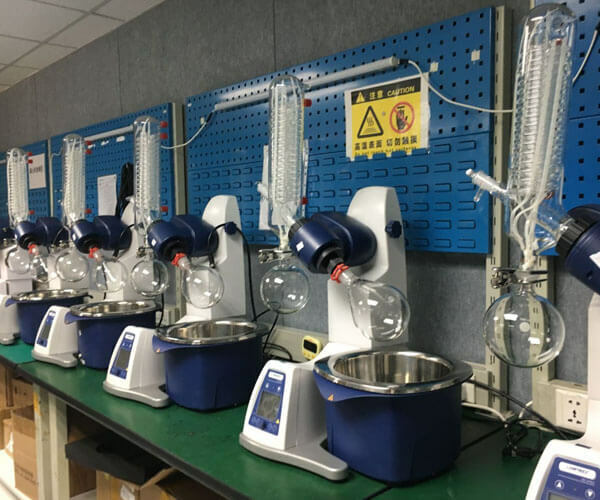 In the previous articles,we have talked a lot about the rotary evaporator,including the working principle of rotary evaporator, classification and application of rotary evaporator in the kitchen, etc.rotary evaporator is a common instrument in laboratory which consists of motor,distillation flask,heating port and condenser.It is widely applied in chemical,medicine,biological engineering and other fields.Today,I will talk about what rotary evaporator is and it’s advantages and disadvantages. 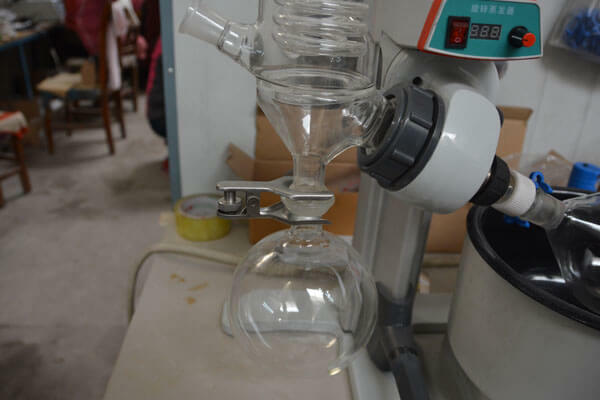 Rotary evaporator is controlled by electricity to increase the evaporation area of the flask at the most suitable speed.Rotary evaporation is mainly used for the separation and condensation of solid reagents.Rotary evaporation works by placing the sample on the bottom of a round flask and heating it in a water bath or oil pan.During the heating, the flask is rotated by the driving of the motor. In this way, the solvent can spread throughout the various corners of the flask, thereby increasing its evaporation area and evaporation rate. At relatively low temperatures, rotary evaporation separates solutes and solvents.Rotary evaporation is mainly used to collect solutes, while the collection solution is mainly used for recycling and reducing pollution. In addition to this, rotary evaporation is performed by using a water bath or a frying pan.For liquids that are not easy to boil, rotary evaporation can be further operated in boiling conditions.Conversely, in the case of liquids that are prone to boiling, rotary evaporation can control its temperature and pressure adjacent to or below the boiling point to ensure that it can evaporate.generally speaking,compared with steam evaporation,rotary evaporation can greatly reduced the experiment time.in general,rotary evaporation can finished in several minutes.the longest time is no more than half an hour.on the contrary,it takes about an hour for the steam to evaporate. But,if the sample is complicated,for example,the sample is food or environment samples,then bubbles will form during rotational evaporation and there will be a lot of impurities left.Rotatory evaporation is a process that separates solutes by their different boiling points, and it can separate all the components after condensation.in addition,vacuum degree is another important factor that affect the rotary evaporation.Rotatory evaporation can be used to separate solids and liquids by their different boiling points.